People have been doing home removals through all of their history. This is actually the only thing that we truly have in common with the first men who walked on Earth and lived in caves – we regularly relocate from one place to another. Actually, the trend of moving is going back in fashion in the past decade. According to statistics, people move home now more often than in the whole second half of the 20th century. The good news is that technology is evolving, often even faster than us. The main reason behind the process of improving technology is improving the quality of the lives we live, e.g. making them easier. This applies specifically to home removals. Let’s have a look at the ways in which modern technology actually makes the whole process better. Some of them are obvious, but we bet you have not thought about the rest. The Internet is your friend. You can use the net for literally anything related to your removal, from finding tips on how to pack more efficiently, to reviews on the moving companies you consider, or forums on which people share their personal experiences with relocations, and showing you that there is nothing wrong with you and it is perfectly normal to feel stressed out. Every van and truck in respectable moving companies is equipped with GPS navigation that helps drivers determine the optimal route on which to transport your goods from point A to point B. 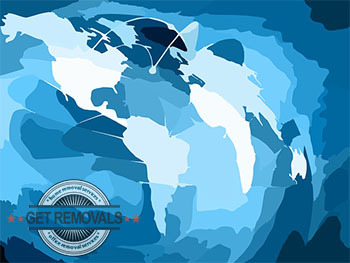 Furthermore, it gives you the opportunity to be able to track your property at any moment, which gives you more securing and peace of mind, which are very important in all sorts of relocation projects. Modern technology simply makes thing easier to move. Everything, from appliances to computers and entertainment sets, and even furniture made from new materials becomes lighter, e.g. easier to move on large distances. On quite a similar note, books have been a real pain for professional movers for decades. There is no doubt that it is always better to work for someone who owns a lot of books, because this means they are more likely to have read a lot of books, which increases the chances to be working for a pleasant person, but then again, books weight quite a lot and take up enormous amount of space. Fortunately for everyone e-books become more and more popular. They take up no space, have no weight and you can literally move a whole library in your pocket. The same goes with music. Even if you have a collection of a thousand albums, if they are not on cd/vynil, you are not going to have a problem with transporting them even to the other side of the globe. These are only few examples. The true benefits of modern technology are so many that it would be unwise to try enumerate them all. And even though there are certain drawbacks to the whole deal too, one should never forget about the positive sides.